In January, the Prime Minister launched the Government’s new national 25 year environment plan – quite a moment for those of us who’ve worked our whole careers in the environmental field. While the initial media interest has been in supermarket plastics and single use coffee cups, which are, of course, important features, the plan is far more fundamental and comprehensive than that. What the plan does for the first time is to recognise that the environment underpins most facets of our modern life, from our health and wellbeing, the wealth of the nation, to our ability to improve the nation’s resilience to climate change. Without a healthy and vibrant environment all of these facets will suffer. Flood resilience is a common thread running through the plan. There are explicit references to enhancing the use of natural flood management, improving sustainable drainage, increasing the flood resilience of the places we live and work, built environment and taking the opportunity to reform farming subsidies to help support environmental enhancement including climate resilience. This is fantastic news. Putting the environment at the heart of flood resilience interventions has to be the right way forward. Ultimately flood resilience depends on a blend of engineering and environmental solutions. We have some of the finest flood engineers in the world in this country. They’ve been the core of our flood resilience work for many decades. They’ve built and operated iconic structures like the Thames Barrier. They’ve introduced innovations like the self-raising flood walls and glass panelled flood walls that keep communities connected to the rivers they depend on. In short, they have been at the forefront of global flood engineering. Approaching flood risk with softer engineered solutions is not new to our engineers. 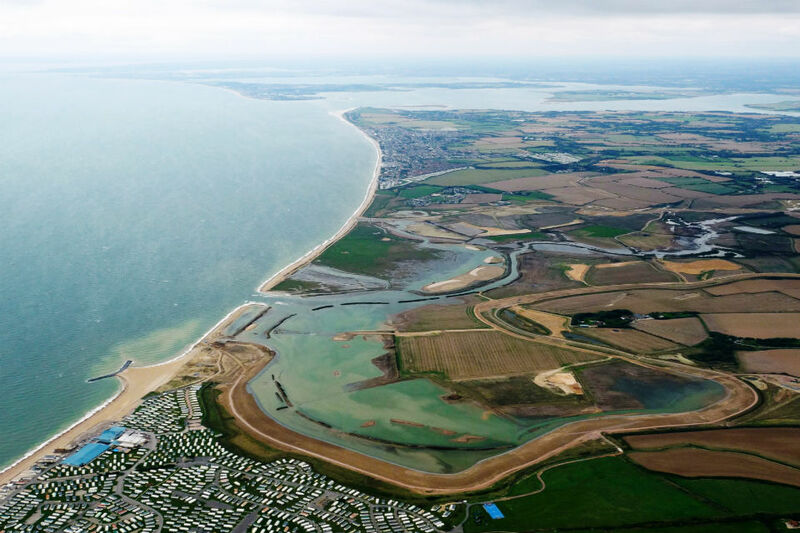 For years, many of our beaches have been managed to take the energy out of stormy seas to protect our coasts and in the northeast flood water has been stored in catchments in the ‘Ings’ – an old Norse word for flood meadows – for generations. What is new is a better understanding of how we can work collaboratively to bring all of these elements of flood management together. Too often the conversation has been about a false choice between hard or soft engineering – as if there is a conflict or competition between them. The approach we need is one where these elements complement each other - one where we work more closely with place builders, infrastructure providers and of course communities to achieve this. I often describe managing flood resilience as a mosaic. There a number of pieces – of many different shapes and sizes - that need to come together to complete the resilience picture. These pieces include raising the awareness of those at risk of flooding, how we respond when floods happen (and they will), how we recover more quickly from those floods – and the full spectrum of interventions we can put in place to reduce flooding, from flood walls and barriers to re-wilding our catchments. It’s how the Netherlands are starting to approach the problem too. They are, of course, a nation who also know a thing or two about flood engineering. Although engineering appears to be part of their DNA, they too are embracing natural flood management and soft engineering approaches. A great example can be seen on the coast at Hondsbossche. For half a millennium, communities in the Netherlands have been protected from the sea by progressively higher flood banks and walls. With sea level rise they faced having to add another 2m to these flood banks. Instead they have created a fantastic system of new sand dunes alongside, and working with, the existing earth banks. These dunes absorb the energy from storms and protect the existing defences but they also provide new habitat for wildlife and recreation and tourist opportunities for the community. It now looks wonderfully natural but engineers were certainly needed to shift the 35 million cubic metres of sand needed to create the dunes! Getting the right blend of flood risk activities also needs a better appreciation of place. By which I mean a better understanding of the interactions in catchments and coastal zones, which is critical to optimising environmental improvements and engineering. It’s something close to my heart. As a hydrologist I spent my early career trying to model water management at the catchment scale, trying to understand the interactions between land use, soil, water and people, so that we could maximise the benefits for all. The methods I used then might have developed out of all recognition since then but the goal remains the same. Bringing together engineering and environmental disciplines and having a sense of ‘place’ is at the heart of how the Environment Agency has developed for the last 20 years. It is why we continue to play such an important part in building the nation’s flood resilience. But we are only a part of the landscape and we can only achieve improvements working alongside other important organisations that understand ‘place’ such as water companies, Internal Drainage Boards and Local Authorities. The Government’s 25 year environment plan provides us with a once in a generation opportunity to bring together engineering and the environment and to embed climate resilience into the way we all work. The key for us all is to take that opportunity. For the Environment Agency that means leading the development of a comprehensive new Flood Risk Strategy for England. One that will set out all the pieces needed to build this nation’s resilience to flooding for future generations and, most importantly, be developed in collaboration with those partners who will help to deliver it. It will bring together how we will collectively achieve the environmental improvements set out in the 25 year environment plan with the engineering solutions we will need to complement them. It will set out the roles we all must play – as individuals, communities and Government - if we are to successfully build flood resilience to climate change. In short it will create the picture to which our flood resilience mosaic will be built. John Curtin is the Environment Agency's Executive Director of Flood and Coastal Risk Management. What does it take to feel comfortable talking about faith and belief at work? If every person in every household in the country turned a light off when they left a room we wouldn't need to build any new nuclear power stations. Similarly if we invested in keeping all our watercourses, ditches, drainage channels and flood storage areas in good order then the need to build more flood defences would be greatly reduced. Making space for water is the answer so let's hope the 25 year plan does what it says on the tin.